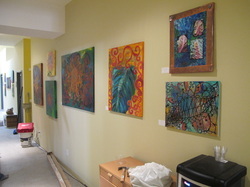 In January 2011 I displayed my art at One Yoga in Minneapolis for their Grand Opening at their new location at 26th and Lyndale. We had a great turn out for the meet the opening reception. Friends helped with the delicious treats and soothing music to make for a fantastic evening! 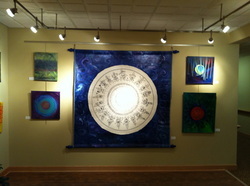 In February 2011 I exhibited my art at Kingsway Art Gallery in Belle Plaine, MN. 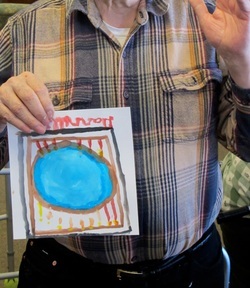 My sister Mary, Dawn Marie and I made mandalas with our friends with Alzheimer's. It was great art therapy for the three of us! 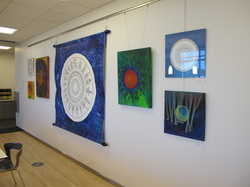 In May of 2010 I had the good fortune of exhibiting my art at Coloplast in Minneapolis. I met Bonnie while working out at LTF and she is the art gallery coordinator at Coloplast. You never know where you'll meet the next person who will want to show your art work! I was a WARM protegee in 2009-2010. 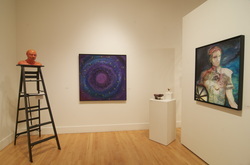 My mentor was Karen Wilcox Here work is the figurative sculpture on the ladder next to my mandala painting. 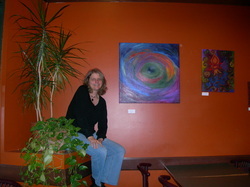 In 2009 Ann’s paintings were exhibited in Minneapolis at Taraccino Coffee in NE Minneapolis, my favorite coffee shop! Taraccino has THE BEST café miel in the metro. Which by the way, when you check out their website you will see my art work in their photos!
. 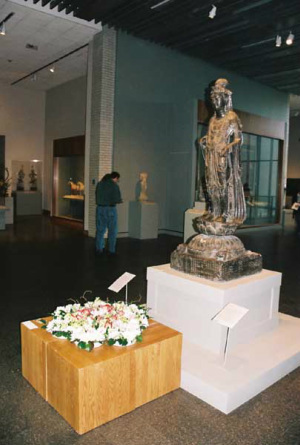 In 2008 Ann created a floral mandala for the Avalokitesvara at the Minneapolis Institute of Art’s “Art in Bloom.” A photograph of the statue with her floral mandala appeared in the spring 2009 MIA ARTS Magazine in an article titled, “Art in Bloom: Timeless Art, Fresh Flowers.” This was the quintessential moment of combining her love of mandalas with her love of flowers.